In every Squirrel’s kitchen, you will find the ultimate secret ingredient, Fleur de Sel. This adds a unique and delicious flavor to your cooking and it will be as if you just graduated from a top culinary school in Paris. Even if you have never been to France, or abroad your cuisine will taste like you are the well traveled Squirrel that we all want to be. Fleur de Sel is the number one reason why my cooking has such flavor. I have actually felt guilty when my guests experience my food and I am smothered with praise for the taste. I have walked around for years allowing people to think I am brilliant when really it’s a little ingredient known as Fleur de Sel. I discovered Fleur de Sel in France one summer. My Mom had already been using it and she told me “this is just not a table salt; this is a gourmet salt that is harvested with great skill and delicacy”. In addition, the fame chef Alain Ducasse says one of the must have essentials in anyone’s kitchen is Fleur de Sel. The salt is harvested off the coast in Brittany or Camargue. What makes this salt unique is that it contains a higher content of minerals. This enables the natural flavors of what you are preparing from meat, vegetables, salads and pasta to cultivate to their full potential. Visiting France once a year allows me to bring back Fleur de Sel to my friends and their mothers. Yes, I am the girl at customs with all of the salt. When asked if I bought anything abroad I answer, “Yes, French salt”. This sparks a conversation with the customs agents who are intrigued by this discovery. Currently, we not only have my friend’s moms exuding pride in their Squirrel kitchens, we have custom agents in Atlanta and New York bragging about their culinary skills and winning over the hearts of their families and significant others. Until House of Squirrels starts selling the salt on our website you may purchase it on Amazon. In addition, HOS will be giving away Fleur de Sel, so make sure to follow us on Facebook and Twitter for details on how to win! Don’t be shy; if you have any questions on Fleur de Sel, make sure to ask by using the contact button! 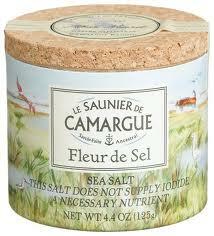 Squirrel Tip: To purchase Fleur de Sel click here. Wow, incredible blog layout! How long have you been blogging for? you make blogging look easy. The overall look of your website is wonderful, let alone the content!. Thanks For Your article about Table Salt No More | House of Squirrels . Flor De Sal D’es Trenc, harvested on the island of Majorca. The ‘natural’,without herbs or spices, is the best, in my opinion. http://www.flordesaldestrenc.com, or in San Francisco,call Karina at 1-415-203-4300.